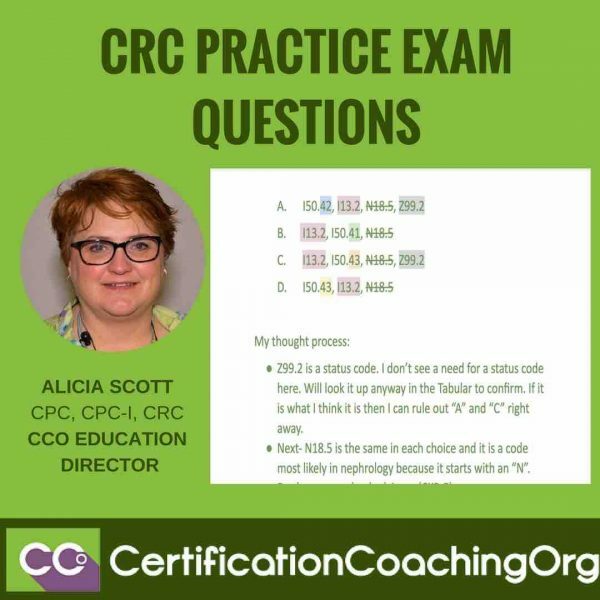 Q: CRC Practice Exam Question – “What does a CRC Practice Exam Question look like? How do we work through an exam question? Mrs. White is diagnosed with acute combined systolic congestive and diastolic congestive heart failure which is due to hypertension with stage 5 chronic kidney disease. What ICD-10-CM code(s) are we going to code for this particular scenario? Alicia: Now, these are the things that jumped out at me. When it’s a crc practice exam or any practice exam, unlike a pre-employment exam, it’s going to be multiple choice, so they’re giving you the codes. And I like to say they know you know how to look up the codes, that’s really not the hard part, but can you pick the proper codes following the guidelines, get them in the right order, that’s a little different. The things that jumped out at this particular scenario is that we have something that’s acute; acute is a red flag term. The fact that the person has systolic and diastolic heart failure, congestive heart failure, that should be a red flag that there is a code for systolic congestive heart failure, and there’s a code for diastolic congestive heart failure; is there a code for a combined? Maybe. Whenever you see the term “due to” – bam! Red flag should be going all over the place because that is pertinent; there is a causal relationship there. Now, hypertension, we have a heart disorder going on with hypertension but then they threw in CKD and with ICD-10, you probably already know that there is a causal relationship between hypertension and CKD, so there’s all kinds of things going on with this scenario. Again, it’s short and sweet; however, that one mistake can trip you up. Here are our choices, we’re going to eyeball those choices for just a second, look at them and I’m going to tell you what my thought process is when I just look at these codes without looking them up yet in the Tabular. Again, four choices, kind of eyeballing them. Now, let’s scroll down here and let’s see how my brain thinks. The first thing I noticed is that N18.5 is all the same, so that tells me that that’s a code I don’t need to look up. I don’t need to pay attention to that code right now, it’s going to be the same on every single choice. Now, some people choose to draw a line through it, so their brain doesn’t keep looking at it, that’s fine. But my eye automatically jumps to the Z99.2. I could rule out two of these really quickly if I look up Z99.2 to see if it’s applicable. Are we going to be able to throw out “A” and “C” right away? That’s one thing that we’ve gotten down to two choices, so we’ve already saved a lot of time. Then, the next thing I’m going to look up is, Hey! Each one of this has I13.2, but I’m not going to draw a line through them like I did with N18.5 because the sequencing is different. That’s pertinent. That tells me that they obviously want me to know do I understand the sequencing between these codes. Then, the code that’s probably going to summate and give us the formal answer is the I50.42 and you notice that we have different characters after the point, so we got 43, 43, 41 and 42. Then, Z codes, I happen to know are things that kind of help explain what’s going on in the scenario. Chandra mentioned it earlier about the Z code that she was talking about. When I go back and I look up there, I’m thinking, “Huh! I don’t see anything that flashes Z code to me,” because I’m thinking probably a status code. Without looking this up or if I look this up, I’m going to assume that it’s a status code, and to be quite honest, it is a status code. Z99.2 is for dialysis. Our patient, it’s not stated that they’re on dialysis. Right there, I have knocked out “A” and “C.” So, you would look it up, you wouldn’t just know that Z99.2 is status dialysis. But when you did, you would say, “Well, this patient isn’t on dialysis, we’re going to knock out “A” and we’re going to knock out “C” right there, so now we’re down to “B” and “D.” Now, I13.2 is in a different sequence on each of those so I need to look up that code and see if there are any sequencing guidelines that are related to that, and then we also are given two separate choices .41 and .43 for the I50 code. N18.5 don’t necessarily need to look it up because it’s already on every single choice and then the same location so I don’t have to worry about that, it just happens to be for CKD 5. And codes that are I codes tend to be cardiology codes and the I13.2 is in every choice, so now I just need to know the guidelines that surround these two codes. I’m going to go ahead and let you look at that. Now, we actually talked about this – Laureen, Chandra and I – the other day about when you’re bubbling and highlighting or what you’re doing while you’re taking a test, some people have said highlighting is something that they like to do, have multiple highlighting colors and you can get one little highlighter that have several colors. Laureen had said just keep all the caps off, and know that by the end of the time you’re taking your test, you’re going to have to throw it away because it would be all dried out. You can do that. I am really driven towards visual and color association, but that confuses me for the testing process. You got to be pretty good and it can be a time taker; so I tend to use circles and squares and other things with a pencil, you need to develop what works best for you and you do that by taking practice exams. The keywords I already said was a specified type of CHF (that was a pertinent thing), hypertension with stage 5 CKD. The rationale here, and I’ll tell where the little tricky part is because actually I looked at this one and I tried to eyeball it and do it without looking up in the Index or anything, I would just say, “I pick this one.” I don’t want to say Chandra caught me but when I read the rationales, like, “Oh! I think I would have missed that one,” because I would have jumped to a conclusion. You’re going to first look up: failure/heart/diastolic (congestive), and then when you get there, there is a choice for combined and congestive systolic and diastolic and acute is always the right term, and that’s going to give you I50.41. That’s the proper code. 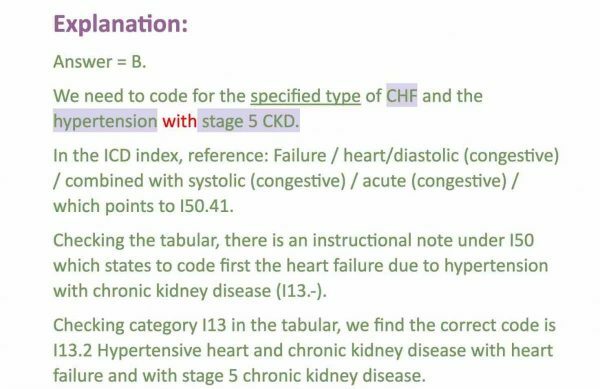 Then, when you look at the Tabular, it’s going to tell you – this is the key – that I50 which states to code first the heart failure due to hypertension with CKD, which is the I13 code. That’s the tricky part. If you don’t catch this, then your sequencing is going to be wrong. That question was specifically written to see all those other things, but do you know the sequencing, do you know to read the guidelines that tell you which code goes first? Then, when you check in the Tabular, it tells you to do (.2) for the hypertension and the stage 5 chronic kidney disease. Then, you go on down, we did the N18.5; so ultimately our code, the correct answer is I13.2, I50.41, the chronic kidney code, and the Z99.2 is not used because the patient is not on dialysis. 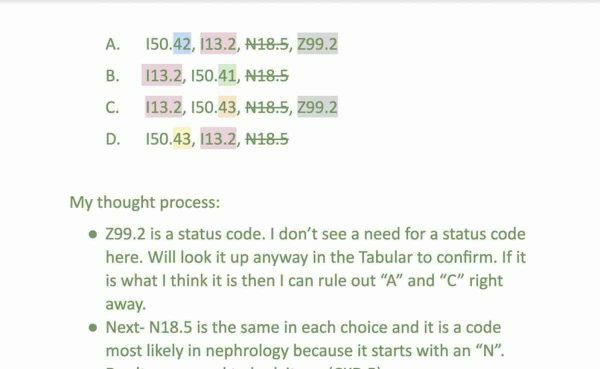 Now, before I stop talking here, I just want to give you a heads-up, do a little study on N18.5 because there are times that an N18.5 is on dialysis and that changes the dynamics of some coding. Going back real quick, the answer was “B.” Let’s look again at how this was divided up and kind of the way this is the way my brain works, but you don’t have to have codes memorized, you don’t even have to necessarily know what letter starts which area, but as you get familiar, as you make your annotations in your ICD-10 manual and you go through the chapters in the course, this is going to resonate with you and it’s going to pop in your brain. Never assume anything; don’t ever go so fast, which is a big fault of mine both assuming and going too fast, that you could slip up and make a mistake. So, I’m not saying run through that quick; however, take the time to break it down before you even have looked up a code and then get an idea of what do they want to make sure I know, and then confirm it. Look everything up in the Tabular, don’t guess, ever. There you go, that is what a CRC practice exam question looks like. Now mind you, this is only the coding aspect. The CRC has so much more than just coding, in fact, it really doesn’t have a whole lot of coding in my opinion. But this is what one would look like. 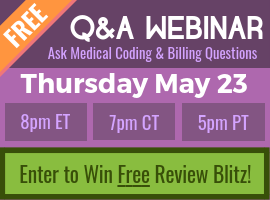 In our risk adjustment live student calls every Wednesday night that we do for our full students, we go through these and break these down and we’ll take specific exam questions every week that involve not just the coding. Isn’t that fun? I know that you’re as excited as I am when you see something like that, but the Blitz is what’s going to help you learn how to break down exam questions like this and make them pop. Chandra: Can I jump in there? I just wanted to jump in on some of the conversation I’ve been having on the chat while you’ve been explaining everything to everybody. A couple of questions that I just wanted to clarify for the whole group because it seems like lots of people have these questions. The first question that we got is: What does CRC stand for? But the question that I got was: Is there anything in the CRC Blitz that talks about how, strategies for these multiple choice questions? Yes, there is a section of the Blitz where Laureen talks about how to take multiple choice exam, that sort of thing. But there was also a conversation that Alicia, Laureen, and some of the other instructors and I had earlier this week and something we’re excited about is we do have in the plans to have a session that we record where we show each of us taking on the same question so that you can see how differently we each think and how differently we each attack a question and you can see that there’s no wrong way or right way, it’s whatever works for you and whatever helps you get through it more quickly. That is something that we’ve gotten development, it’s coming on the way as well. Alicia: I forgot. That’s right. That’s going to be exciting for a lot of people because, again, I think we learn differently. But things, like Chandra said, different viewpoints, you may resonate more with one person than another. Very exciting. There’s always good stuff coming from CCO, isn’t there?